February 3, 2017: India’s leading fruit juice player, Manpasand Beverages Ltd has reported a 49.28% rise in net profit at Rs. 7.24 crore for the third quarter ended December, 2016 as against net profit of Rs. 4.85 crore in the corresponding quarter of previous fiscal. Gross sales for Q3 of FY 16-17 at Rs. 103.85 crore were higher by 13.97% over previous fiscal’s same quarter gross sales of Rs. 91.12 crore. Earnings Per Share (EPS) for Q3FY17 was at Rs. 1.27. Mr. Dhirendra Singh, CMD, Manpasand Beverages. For the nine months ended December 2016, company reported a net profit of Rs. 41.29 crore against a net profit of Rs. 24.89 crore in the corresponding period last year, a growth of 65.89%. Gross sales in nine months of FY 2016-17 at Rs. 444.19 crore were higher by 40.80% compared to Rs. 315.47 crore in the corresponding period of previous fiscal. EPS for 9 Months ended FY 2016-17 was at Rs.7.88. The Rs. 500 crore raised through a QIP issue recently is well placed to fund these four new plants. Four new plants are going to be set up in future with total production capacity of 2 lakh cases per day as against the current 1.7 lakh cases per day. The new manufacturing units will source local produce to help meet the continual demand for Mango Sip and Fruits Up. In order to give a boost Fruits Up, the company has enrolled Bollywood actress and celebrity Tapsee Pannu as its brand Ambassador in the last quarter. In the coming days, the company will be bringing out newer brands into the market and will also forge strategic alliances with key retailers. One of the country’s leading fruit juice players with Rs. 556 crore plus net sales in FY2016, Manpasand Beverages Limited has got the unique distinction of being the only pure play Company in this sector in the Indian capital market. 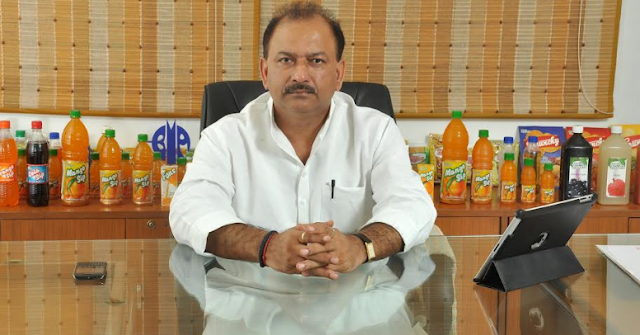 Manpasand Beverages represents the successful story of a visionary first generation entrepreneur, Dhirendra Singh, who has built one of India’s fastest growing fruit juices company and is now ready to take on the global cola giants head-on. Manpasand Beverages is a fruit drink manufacturing company with a primary focus on mango fruit, which is the leading flavour for juice drinks in India. Company’s flagship brand, ‘Mango Sip’, a mango-based fruit drink, is strategically focused towards customers primarily based in semi urban and rural markets. With a view to expand its product portfolio and target the urban markets, Manpasand launched its ‘Fruits Up’ range of products which offers fruit drinks and carbonated fruit drinks in different flavours. Without any synthetic base, 'FRUITS UP' is made up of natural ingredients and comes in a range of carbonated and non-carbonated fruit drinks. With ‘Fruits Up’, the company plans to capture part of the huge carbonated drinks market, which is estimated to be worth around 25,000 Crores. Recently, the company has entered into packaged tender coconut water segment through their new brand, ‘Coco Sip.’ In terms of health drinks, ‘Manpasand ORS’ is afloat in North Eastern and soon has plans to go pan India. Manpasand’s beverage brands are present in 24 states through more than 200,000 retailers, over 2000 distributors and 200 plus super stockists. The company has two manufacturing facilities at Vadodara in Gujarat, one each at Varanasi in Uttar Pradesh and Dehradun in Uttaranchal and a new one is being set up at Ambala in Haryana. In the fast and ever-growing fruit-based beverages market in India, the Company has emerged as a significant and formidable competitor to the National and Multinational beverage giants. A customer-centric approach, value-for-money offerings, strong focus on affordable price points, innovation and research, brand building, aggressive production capacity expansions and strong distribution strategies are the Company's major strengths.